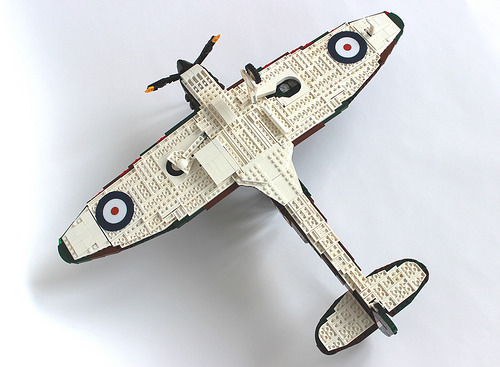 Whilst the Battle Of Britain saw the RAF fly more Hawker Hurricanes, the Supermarine Spitfire’s beautiful lines marked it out as the signature British fighter of WW2. This large LEGO model by Lennart C manages to capture the iconic shaping and curves perfectly — no mean feat in the brick. The 1:18 scale employed is impressive — with the model stretching to over 50 studs long by my count — allowing the creation of accurate brick-built camouflage. This, coupled with some simple stickers makes for a wonderful re-creation of the famous fighter. The attention to detail on show is impressive, with 8 Browning machine guns built into the wings, and nice use of “macaroni pipe” pieces for the engine exhaust cowls. 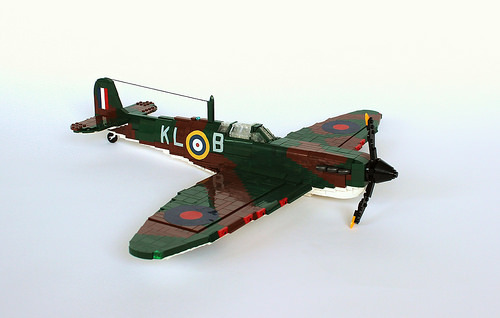 Don’t miss the underside, with its working undercarriage — excellent work.